When I first came to Taiwan over a decade ago, one of the first things I absolutely had to do was buy a scooter. I often take heat from expats living in Taipei who scoff at the idea of owning a scooter, but at that time having a scooter meant that I could freely explore the completely foreign area I was living in and I could take care of my daily business much more easily. Taiwan was a bit different back in those days (it wasn’t actually that long ago) and when it came to having a scooter, it didn’t really matter if I had already obtained my residency permit, a drivers license or even if I wore a helmet. My friends and I were able to walk into a local scooter shop, negotiate a price and a few days later walk away with some finely tuned second-hand scooters for which to explore with! A few days after buying my first scooter, I came home to a table full of Taiwan Beer and my new friends patiently waiting for me. They said we were going to take a ride out to check out some 'mountains' and a 'reservoir'. I sounded like a weird plan, but who was I to turn down an adventure that involved free beer? Little did I know that after my first ride out to Shimen Reservoir (石門水庫) that I’d be end up living in Taiwan for so long, nor that I’d find myself driving out there countless more times to enjoy the beautiful scenery. Shimen Reservoir has been attracting tourists since it was completed in the early 1960s. Tourists come not only to enjoy the spectacular scenery created by the dam, but all of the tourist attractions that later sprung up in the area around the dam. As of late the reservoir has become an area for nature enthusiasts who enjoy the beauty of the artificial lake by taking ferry rides, hike to the peak of Shimen Mountain (石門山) or who come to enjoy cherry, peach and Tung blossoms, azaleas and maple trees. There was a time though when the area was home to several amusement parks, large resorts and a bunch of other random tourist traps. Even though 'tourism' has been a constant fixture at the reservoir since its completion, the number of visitors tends to vary by season. In the 1970s and 80s people developed the crap out of the countryside with little thought into the actual business side of things. Visitors today are likely to notice a few of the various attractions that have been abandoned over time which is clear evidence of not only the overzealous nature of the way the area was developed but also the unsustainable nature of the tourism industry and the downfall of Taiwan's once booming economy. The view of Shimen Dam from Buddha's World. 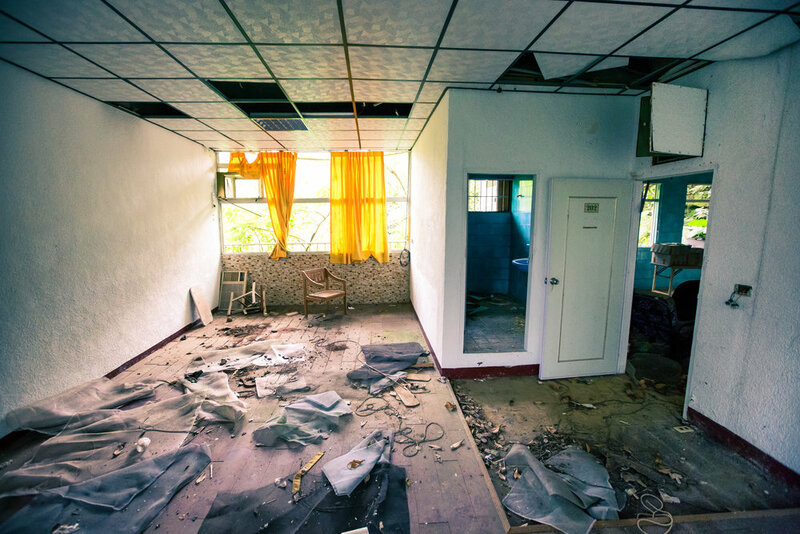 There are a number of other abandoned attractions and resorts in the area which notably includes the Sesame Hotel (芝麻大酒店), Kunlun Gardens (崑崙養生莊園), the Golden Birds Paradise (金鳥海族樂園) and the Asia Paradise Theme Park (亞洲樂園) among others. The subject of today’s post is a semi-abandoned amusement park which was once known as 'Fairy Tale World' (童話世界), but is now known as “Buddha World” (佛陀世界). Even though its not an amusement park anymore, Buddha's World has become a popular weekend stop as it has become a spot for urban explorers as well as the so-called Instagram internet beauties (網美) of Taiwan. On one of those early trips to Shimen Reservoir, I noticed that there were some weird objects and broken bridges protruding from the mountain on the southern side of the dam. Each time I visited I tried to figure out a way to see what was going on, but eventually came to the conclusion that I’d probably have to use a boat to get there and that wasn't likely to happen. The mysterious objects however slowly disappeared over time and it seems like each time I visited the dam there was less of what was once hidden on the mountain. Then all of the sudden a castle-like structure suddenly went viral on Instagram becoming a weekend hot spot for curious onlookers and the mystery was solved! The castle is part of what is now called “Buddha’s World” (佛陀世界), a quiet Buddhist monastery that was constructed on land which was once home to an abandoned theme park. The theme park, which was originally named Fairy Tale Land (童話世界) was a large knockoff of Disneyland that opened up over forty years ago. The park ultimately ended up being forced out of business by the local government a few decades ago due to environmental issues. The land around the reservoir is notorious for having sediment issues and the local authorities couldn't allow construction in the area to cause water degradation to the reservoir which provides water service for millions of people in northern Taiwan. The land was later bought by the Rinzai Buddhist sect (臨濟宗) who thought that they would be able to use it not only for a monastery, but a Buddhist themed park for tourists. Unfortunately, the same environmental concerns that forced Fairy Tale Land out of business made it impossible for the sect to construct anything on the land meaning that the planned theme park would never come to fruition. With the idea for an amusement park abandoned, the area became a place of solitude for the monks and nuns who lived there. The original structures that were left over from Fairy Tale Land still existed, but were used merely for storage forcing most of them to fall into disrepair and eventually being torn down. For most people, the main attraction of Buddha’s World is the Fairy Tale Castle, which is only a short walk from the entrance. The castle is admittedly quite picturesque with the mountains behind it but it is also not long for this world as the building has become hazardous. If you continue on past the castle, you’ll pass by a fake looking statue of Mickey Mouse and then further on there is a giant statue of what looks like Sun Wu-Kong (孫悟空) of “Journey to the West” (西遊記) fame. The statue is hideous and looks very much like something that you'd expect from 1980s Taiwan. Beyond the statue you’ll find a platform that offers beautiful views of the Shimen Reservoir as well as a Buddhist temple where the monks and nuns likely spend a lot of time in quiet contemplation. The real treat for explorers though is if you continue down the mountain where you’ll find at least four abandoned castle-like buildings that were once used as accommodations for people visiting the park. The largest of those (which is the one closest to the lake-shore) is completely open and you’re able to walk in and explore. If you want to visit Buddha’s World, there are a few things you have to remember - The area is on private land owned by a Buddhist group. They allow guests to enter free of charge but only on weekends and only between 9:00am - 3:30pm. While you are visiting, I recommend exploring a bit more of the park than just the castle at the entrance. If you take the time to go, at least check out the viewing platform which is only a five minute walk away from the castle where you are able to take some beautiful photos of the reservoir. While this one could be considered 'urban exploration', I think most people are just visiting for a shot of the castle, which is a rare sight in Taiwan. I took a bit of extra time and explored the rest of what the park has to offer and I think you should too. But that will take a bit of a hike to get all the way down the hill and you may be a bit disappointed with what you find. You'll be able to explore the abandoned hotel at the bottom though and the old waterslide is kind of a cool thing to look at as it has been completely taken over by nature. I don’t usually reveal locations when it comes to urban exploration sites, but this place is hardly a secret anymore, so there isn’t much point. The route to Buddha’s World is along a mountain road that takes you from Taoyuan into Hsinchu’s Guanxi Village. It is an easy road to navigate and there isn’t a lot of traffic, so if you are on a bicycle, a scooter or are driving a car, you’ll be able to easily find your way.